In 1991, Michel A. Corke was enjoying the summer break from his position as a music teacher in a Chicago high school when he started to develop sleeping problems. He had recently turned 40, and seemed to be in good health, but it was soon very obvious that he was suffering from more than just your run-of-the-mill insomnia. It wasn't just taking him longer to fall asleep than normal. Nor was he suffering from the common problem of waking up frequently over the course of the night. He wasn't sleeping at all. Within a few months, Corke's lack of sleep was causing obvious physical and mental deterioration. He developed problems with balance and had trouble walking. He began to display signs of dementia and there were times when he appeared to lose touch with reality. Sometimes these episodes involved hallucinations. After Christmas, he was admitted to the hospital. At that point, Corke was unable to communicate. He had become completely dependent on his family to help him perform even the simplest tasks like showering and getting dressed. His decline had been rapid and pervasive. At first, doctors could not figure out was wrong with Corke. They diagnosed him with multiple sclerosis, despite the fact that he didn't really have the symptom profile of someone with the disease. But doctors soon recognized that something was very unusual about Corke's "sleep." Even though Corke would often close his eyes and appear to be sleeping, measurements of his brain activity found that his brain never did actually fall asleep. This helped doctors to realize that he was suffering from a disease that had only been recognized within the previous decade, called fatal familial insomnia (now often called fatal insomnia because not all cases seem to be hereditary). In the disease, sleep becomes progressively disrupted until patients exhibit little to no sleep. Eventually, death is inevitable. Michel Corke's case was no exception. By the time he had been admitted to the hospital, about 130 days had passed with minimal sleep. When he died, he had essentially been awake for 6 months. What are the symptoms of fatal insomnia? Fatal insomnia is a rare disease that usually develops in middle age or later (the average age of onset is 51 years), and begins with complaints of trouble sleeping or excessive fatigue during the day. At first, due to this extreme daytime sleepiness, the assumption might be that the patient is plagued by a condition that is making him too sleepy. Sometimes there are other abnormal signs early on, like double vision, impotence, hypertension, and increased perspiration, lacrimation (i.e. tear production), and/or salivation. As the disease progresses, patients lose their ability to sleep altogether. A variety of movement problems appear, including difficulties with balance and coordination and abnormalities in gait. Patients also will sometimes become delusional and display unusual behavior that resembles dream-enactment, which involves unconsciously making movements related to what's going on in a dream. Later in the disease, after a patient has been deprived of sleep for some time, he begins to spend more and more time in a stupor from which it's difficult to rouse him. He may experience sudden, spasmodic movements, but voluntary movement like standing and walking often become difficult to impossible. He may lose the ability to speak, have trouble swallowing, and fall into a vegetative state. Death can occur at any time throughout these phases of the disease, but if the patient survives long enough often he will fall into a coma, which will lead to death. The duration of the disease ranges from 8 to 72 months, with an average disease course lasting just over 18 months. What happens in the brain in fatal insomnia? One way to verify the sleep disturbances occurring in fatal insomnia is to measure sleep activity over the course of a night using a technique known as polysomnography. Polysomnography measures the electrical activity in the brain (using an electroencephalogram, or EEG) along with a number of other physiological changes that occur during sleep like eye movement, muscle activity, and the electrical activity of the heart. Polysomnography is often used to verify a case of fatal insomnia because patients may appear to spend periods of the night sleeping, as they have their eyes closed and aren't moving. Polysomnography reveals, however, that their brain activity doesn't resemble a pattern of normal sleep. In a healthy person, during sleep the brain cycles from relatively light sleep into a period of deep sleep into a period a rapid eye movement (REM) sleep. A full cycle takes about 90-120 minutes and is repeated 4-6 times per night. These different stages of sleep have characteristic electrical activity that can be measured with an EEG. Patients with fatal insomnia will, of course, display drastically reduced total sleep time. But even at times when it appears as if they are asleep, the EEG still won't show these characteristics of healthy sleep. Instead, their brain activity generally indicates wakefulness for most of the night, with very brief periods of light sleep (i.e. stage 1 or stage 2 sleep) and occasional sudden episodes of REM sleep that only last seconds or minutes. Deep sleep mostly disappears, and as the disease progresses all traces of REM sleep may disappear as well. The thalami are the orange, oval-shaped structures in the image. They are the site of the most significant neurodegeneration in fatal insomnia. Fatal insomnia is associated with severe neurodegeneration of the thalamus, which is thought to be a critically important structure in sleep regulation. 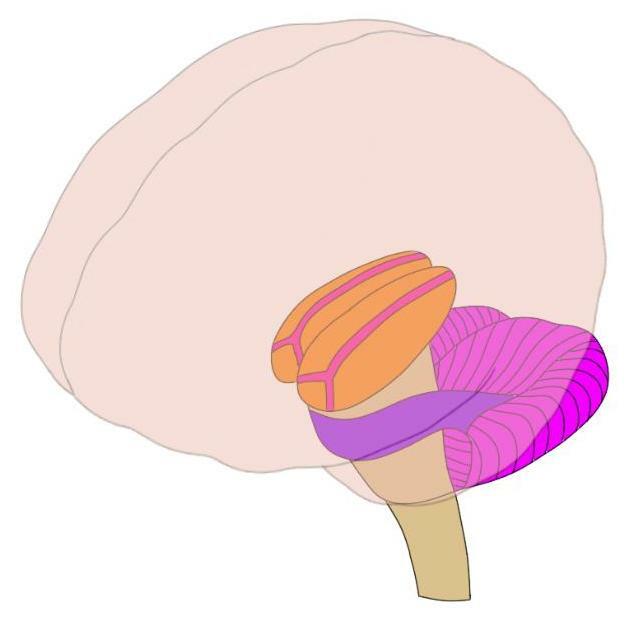 The thalamus is believed to play an especially important role in the generation of a type of deep sleep known as slow-wave sleep. Over the course of the disease, up to 80% of neurons are lost in certain nuclei of the thalamus. The inferior olivary nucleus, a structure in the brainstem that is densely interconnected with the cerebellum, also suffers significant neurodegeneration in the disease, losing more than 50% of its neurons. The role of the inferior olivary nuclei in the symptoms of fatal insomnia is still unclear. It may be involved in generating movement-related symptoms like tremor and spasmodic muscle contractions, but some evidence suggests the olivary nuclei and cerebellum are involved with sleep as well. The disease is also sometimes associated with the formation of large abnormal compartments, or vacuoles, within neurons. These "holes" in the brain can give the brain a sponge-like appearance. In fatal insomnia, this occurs primarily in the cerebral cortex. Prion proteins also are capable of passing their misfolded state on to other healthy proteins. Thus, they can spread within the brain of an infected patient, gradually increasing the number of misfolded prion proteins. Interestingly, their "infectious" quality also allows prions to cause disease if transmitted from one host to another. While it isn't thought that fatal insomnia is spread among people in this way, the disease has been transmitted to mice by injecting them with a liquefied piece of brain tissue from a human patient who had the disease. In fatal insomnia, however, there are relatively few clusters of prion protein in the brain as compared to other prion diseases. And, while deposits in some areas of the brain increase in number as the disease progresses, this isn't true for the areas that experience the most neurodegeneration---like the thalamus. Thus, it's still unclear what exactly causes the neurodegeneration that produces the symptoms of fatal insomnia. Most of the cases of fatal insomnia identified to date are considered genetic diseases, attributable to a genetic mutation in the PRNP, or PRionN Protein, gene---a gene that's implicated in other prion diseases as well. The mutation is an autosomal dominant mutation, which means that if someone with the mutation has a child, the child has a 50% chance of ending up with the same mutation. When fatal insomnia is inherited, it is generally referred to as fatal familial insomnia. To date, just over 200 individuals worldwide are known to carry the mutation associated with fatal familial insomnia. Due to the global distribution of the disease, some researchers have suggested it is caused by a recurrent mutation that has happened independently in a number of families. In 1999, the first cases of what seems to be non-hereditary fatal insomnia appeared. Non-hereditary fatal insomnia is commonly referred to as sporadic fatal insomnia, and to date 32 cases have been identified. These patients display most of the same symptoms and pathology as fatal familial insomnia patients, but they have no family history of the disease and do not have the mutation of the PRNP gene seen in fatal familial insomnia patients. What is the treatment for fatal insomnia? We are severely limited in our ability to treat fatal insomnia patients. Even the strongest sedatives (e.g. barbiturates, benzodiazepines) do not cause patients of the disorder to sleep. Thus, treatment focuses on relieving the symptoms of the disorder as much as possible (which alone is a challenge). Cracco L, Appleby BS, Gambetti P. Fatal familial insomnia and sporadic fatal insomnia. Handb Clin Neurol. 2018;153:271-299. doi: 10.1016/B978-0-444-63945-5.00015-5. Montagna P. Fatal familial insomnia and the role of the thalamus in sleep regulation. Handb Clin Neurol. 2011;99:981-96. doi: 10.1016/B978-0-444-52007-4.00018-7.